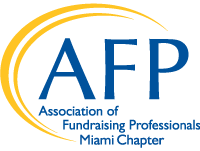 With over 30,000 fundraising professionals across the national organization, the Association of Fundraising Professionals is well represented locally through AFP Miami. The chapter was founded in 1975, however, most well-known for hosting one of the first National Philanthropy Days back in 1985. Today, National Philanthropy Day is celebrated by AFP chapters throughout the world. Our primary purpose: educate and advance the careers of those in the rapidly changing field of development. AFP Miami promotes ethical standards, networking for members, and provides access to listing local, regional and national employment opportunities. Chapter dues are $50 (in addition to AFP International membership dues). For more information on joining our AFP Miami, please contact the chapter administrator at afpmiami75@gmail.com. The Association of Fundraising Professionals represents more than 30,000 members in 200 chapters throughout the world, working to advance philanthropy through advocacy, research, education and certification programs. The association fosters development and growth of fundraising professionals and promotes high ethical standards in the fundraising profession. Diversity in fundraising - Diversity is the seeking and achieving of a broad representation of experiences, perspectives, opinions, and cultures. Inclusiveness is an essential source of vitality and strength for the effective pursuit of an organization’s mission. To ensure that our AFP chapter reflects, represents and responds to the cultural diversity of the Miami-Dade community. inclusiveness and justice transcend our differences. We believe that diversity, inclusiveness and understanding increase productivity, enrich problem-solving, and heighten creativity. We believe that diversity enhances our profession, strengthens our sense of community, broadens our understanding, and moves us all toward the greater good. Approved by the AFP Miami Board of Directors on December 8, 2010. Joining the AFP Miami Chapter is simple and easy. Whether you are new to fundraising or a seasoned veteran, membership in the Miami Chapter is a great move for career advancement.